BBQ aficiandos will argue if you really NEED to remove the membrane on the backside of a good slab of ribs. I say it’s a nice thing to do if only to make it easier to pull apart and eat each individual rib. Some like a bit of a chew. The additional benefit is that it allows for a deeper penetration of your favorite rub or marinade. The simple trick to removing the membrane is to use a clean paper towel to grip the slippery tissue. I haven’t met a cook that has a grip tight enough to grasp the membrane firmly enough to pull it off the slab! Simply use a butter knife to begin the peel on one end. Then grasp what you can of the tissue (the membrane is on the boney side of the rib). If you’re lucky you should be able to peel off a nice clean sheet. It often times takes a few peels to get it all. If you can’t get every fragment – don’t sweat it. You’re guest will likely not notice smaller amounts remaining. A PECAN crust on your BabyBacks? Everyone at BBQ Tricks.com is ready to try this neat use for Pecans.Inspired by a Dominican Republic drink known as Mamajuana (also described as Dominican Viagra! 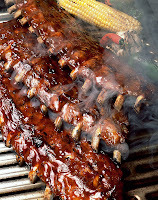 ), these ribs go through a two-stage cooking process. First a slow braise to tenderize the ribs, then grilling and basting for the char flavor and crispy goodness. Don’t limit your babecue to just smoking with hickory and mesquite. Try Basil Twigs. 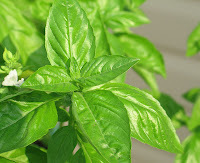 If you happen to grow fresh basil during the summer months you’ll likely find that you have an dry bush of twigs as winter nears. Not good looking… but good for cooking! Use the completely dried twigs to add flavor to your next cook out. Soak the twigs as you would any wood chips and use them to add that secret basil flavor to pork chops or a good London broil. Enjoy a cold one while your buddies argue over what wood your using! Cut the ribs off in a manner that will force you to discard every other bone. 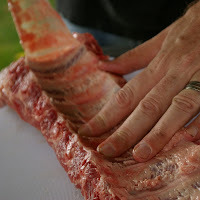 You will essentially scalp the “middle” rib to allow the bones on each side to showcase the meat. You’ll NEVER see them offered this way in restaurants because there is some waste involved. As the cook – you can reserve the “discarded” and skinny middle bones as a snack for later. They’ll still have SOME meat… but NOTHING compared to the monsters you’ll have on the serving tray.